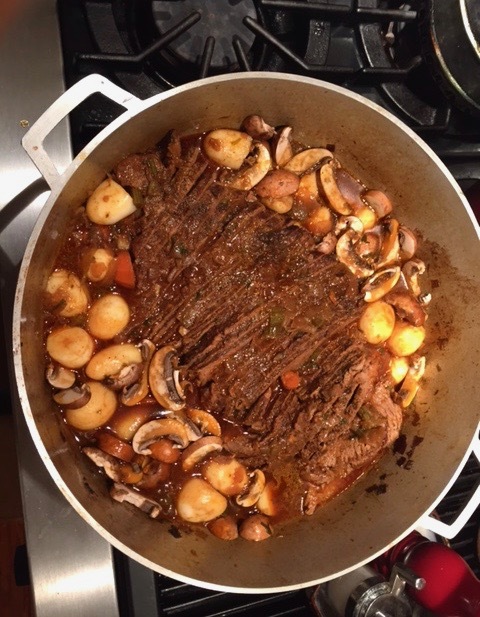 Judaism 101 on Blogfinger: don’t let your pot roast on Passover. This year Passover will begin on Friday night, March 30 with the first seder. Many Jews in America will have two seders (3/30 and 3/31.) In Israel they only celebrate the first night. Food is very important in Jewish traditions. For example on Passover, among a number of traditional foods, we eat matzah (singular or pleural and pronounced “matz’uh” and spelled in a variety of ways such as matzoh or matzo. ) If you want to stimulate an interesting discussion among Jews, start a debate on how to spell and pronounce this delicacy. Suffice it to say that matzah crumbs get into everything, including my bed—-don’t ask! Another traditional dish that most everyone looks forward to is pot roast. Eileen’s delicious pot roast is made from brisket, and she magically turns that into the delicious dish shown above, served with potatoes, gravy and mushrooms. 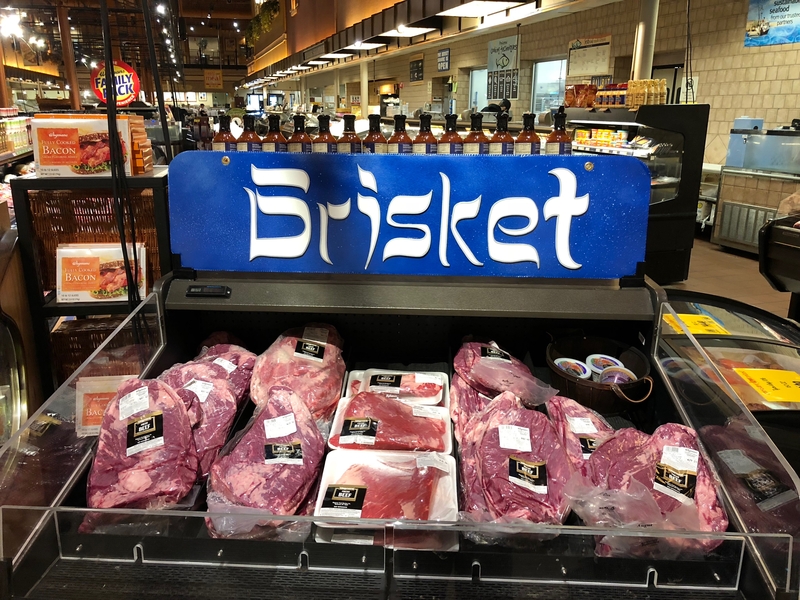 Of course, if one is having a bris, ie a circumcision, brisket would be perfect, and that is why the males at our seder stand back when Eileen slices the meat. Wegmans is ready for Passover. In case you were wondering if this display is for Jews, they made the sign with Hebrew-style letters. Blogfinger photo. March, 2018. Blogfinger photo ©. Here’s Eileen’s recipe for her fabulous pot roast. Here is a post from Passover 2017. And here is a link regarding Passover in the Civil War. * A fresser is a Yiddish word–it means someone who likes to eat or snack.